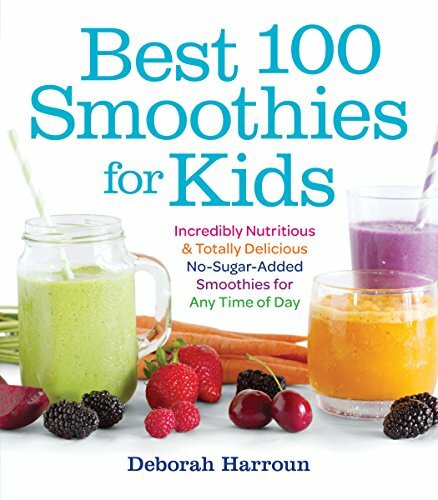 Best 100 Smoothies for Kids: Incredibly Nutritious and Totally Delicious No-Sugar-Added Smoothies for Any Time of Day | Where Do I Go? We all know how important it is to give our kids a healthy, balanced diet. But how best to make sure they are getting all the vitamins and nutrients they need when fruits and vegetables are some of the least favorite items on their plate? 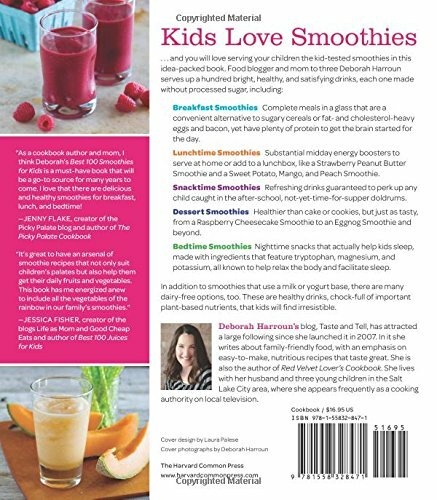 Popular food writer, blogger and mother of three Deborah Harroun has the answer in 100 delightfully flavorful and nutritious recipes for kid-friendly smoothies. Her newest cookbook, BEST 100 SMOOTHIES FOR KIDS offers up kid-test and kid-approved recipes that are sure to please everyone in the family. The book includes recipes for fruit- and vegetable-based juices, as well as a variety that combine fruits and veggies or get their flavor and nutrients from things other than produce. The chapters include Breakfast Smoothies, Lunch and Lunchbox Smoothies, Snacktime Smoothies, Smoothies for Dinner, and Dessert Smoothies. Two special chapters cover Holiday Smoothies, such as pumpkin-flavored smoothies for Thanksgiving or Christmas, and Bedtime Smoothies, made with tryptophan-rich milk bases and with soothing ingredients like chamomile, cinnamon, vanilla, and lemon. What’s better than a well-fed and happy child who falls asleep easily after a busy day? Harroun also provides a variety of different options for creating the perfect smoothie, with recipes that include milk- and yogurt-based smoothies as well as dairy-free options made from juice, water, rice milk, almond milk, and soy milk. There are even numerous gluten-free and vegan options as well. Harroun serves up a hundred bright and colorful, healthy and satisfying drinks in this new four-color and photo-rich cookbook. The emphasis throughout is on providing a wide range of flavors, colors, and nutrients, guaranteed to broaden the horizons of any child who thinks carrots or apples are the only acceptable items from the supermarket’s produce section. Parents – and doctors and dentists – can take heart in the fact that Harroun uses no processed or white sugar for sweetening her smoothies. With all these options for creating inspired smoothies, parents no longer have to worry about making sure their children are getting all the nutrition they need. The only challenge is figuring out which of these delicious recipes to try first!